The market plunged Thursday against the backdrop of a congressional feud with the White House over a continuing budget resolution, but the markets were more focused on the worries that have been festering over global growth and the potential for recession. “You can guarantee if the government shuts down it’s going to very soon reopen,” said Boockvar. “This could be a carry through from yesterday, that’s legitimate. The problem now is this is the first time in years in this bull market that people are doing tax-loss selling. That’s helping to exaggerate the move. You’re also having redemptions.” Since the Fed announced its rate hike Wednesday, the Dow was down 815 points. The sharp drop in stocks since early October was unexpected and even more crushing recently, since December is typically a positive time for stocks. The 10 percent decline so far in the S&P 500 is its worst December performance since 1931. If it remains this way, it would the first time ever that December is the worst month of the year for the index. “It is entirely possible that looking out over the next three to six moths this correction turns into what you would call a bear market because of the fact that the Fed really didn’t show sufficient sensitivity to the affect of policy tightening on the speed of asset price changes to the downside,” said Julian Emanuel, chief equity and derivatives strategist at BTIG. Emanuel said he’s not yet worried about a recession, but fears the Fed will make a policy mistake that could bring one on. But the Fed is not the only worry. Also topping the list is the uncertainty surrounding the trade negotiations between the U.S. and China. The Chinese economy is already weakening, and investors worry weaker global growth will spread to the U.S., where the housing sector has begun to show weakness as the Fed raised interest rates. He added that the broader problems with China could continue but there’s still potential for a trade deal before the March deadline, which could appease markets. Another big concern is a major slowdown in earnings growth. Market consensus is for 7.5 percent growth in 2019 in S&P 500 earnings, down from more than 20 percent this year. Ed Keon, QMA chief investment strategist and portfolio manager, said his forecast is even more negative — at zero growth. “How I interpret the market action yesterday and today, I think it basically means the market’s convinced it’s already too late for the Fed. We already have rates that are high enough to push us into at least a growth recession,” he said. Keon is also concerned about trade. 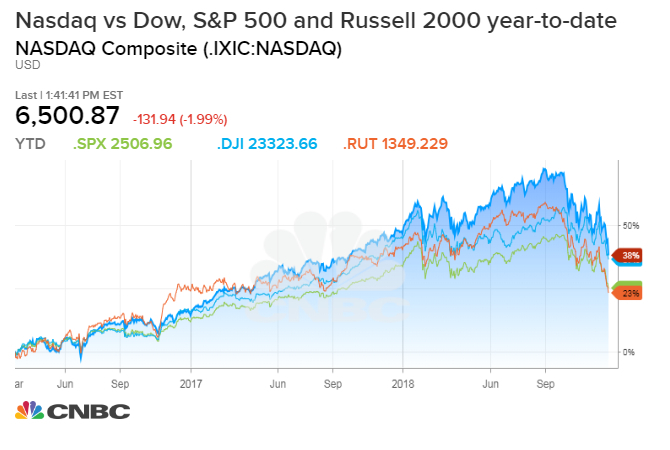 He said when the market turned higher Dec. 3 after President Donald Trump‘s meeting with Chinese President Xi Jinping, he began lightening up on stocks, and continued to sell into rallies. Stocks ultimately sold off on trade concerns even though the two sides have agreed to hold off on any new tariffs for 90 days and China has made some purchases of U.S. soy beans.